Starbytes is the crowdsourcing platform developed by Reply that connects an Italian community of digital professionals and freelancers with everyone who needs design and development services or a piece of creative work. ​​ Starbytes is the crowdsourcing platform for Italian businesses wishing to use the crowd to progress projects and produce digital products and services. Created as an exclusive online service for the Reply network, Starbytes is now a certified community of over 45,000 members – creative experts, web designers, copywriters and professionals from the worlds of ICT and digital technologies. Small and medium-sized enterprises, start-ups, communications agencies, major corporations and entrepreneurs form Starbytes’s main clients. 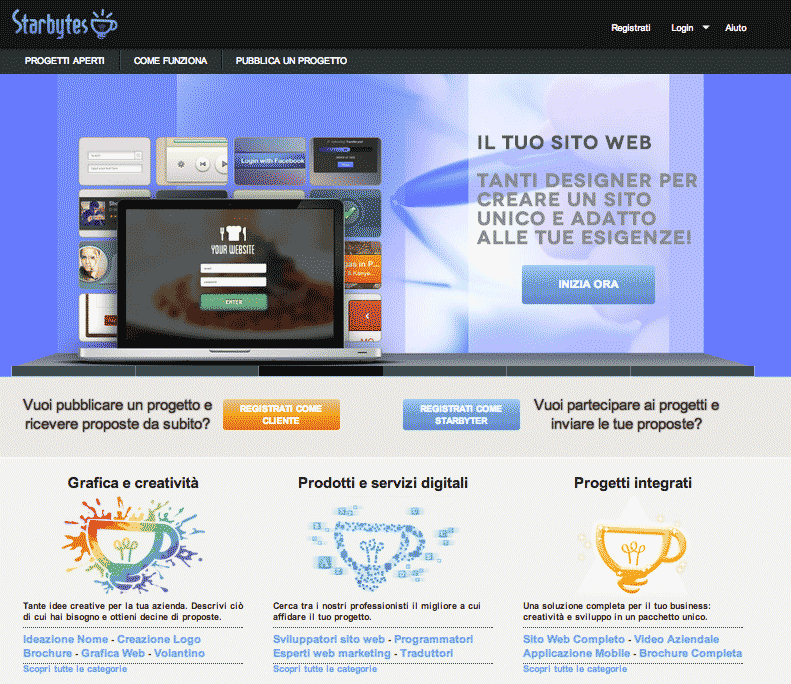 Starbytes opens up an array of possible solutions to suit different budgets, all from a 100% Italian community. Starbytes offers personalised solutions dedicated to major corporations wishing to exploit the crowdsourcing model, with consultancy support to identify the most suitable approach for their various specific requirements. A wide range of essential services can be devised, delivered and implemented to enable and maintain the desired scenario, from contract and payment management to community moderation, PMO and more..
​Cre@Sito is Wind Business’s dedicated self-service website-development offer that uses the Starbytes community’s skills to tailor sites to suit any client requirement. Thus, SMEs can position themselves on the web with a professional, easy-to-use site backed by the unique expertise of Starbytes professionals. And Starbytes customers can enlist qualified professionals to enhance their website even further, from the copy to tailored graphic design and management of campaigns to generate greater visitor traffic. Appsquare is a virtual marketplace for anyone with an idea for an innovative new smartphone/tablet application. The “inventors” can submit their ideas for the users to judge, and the community adds value to each idea by supporting and voting for it. 3 Italia can select the most popular ideas and turn them into real mobile apps for publication in the various application stores. The Appsquare project marries various innovative features in which Reply has been investing for some time, like cloud computing, social networking and crowdsourcing. Appsquare is powered by Starbytes™ – the Reply-developed crowdsourcing platform based on a cloud architecture – and is intended for businesses looking to implement an open-enterprise model to develop projects, services or products using a skilled digital community over a direct, unmediated channel between demand and supply. In particular, Starbytes™ supports crowd engagement in 2 ways: by stimulating interaction via gamification mechanisms; and by helping supply meet demand through contests and tenders and by raising the profile of the most deserving people through feedback and ranking systems. The Enterprise Social Network solution TamTamy™ is Reply’s response to the emerging communication, Engagement, training and cooperation scenarios. It can be applied both in business (for employee networks, participative intranets, and Social Learning) and in the public sphere (consumer or business-to-business communities) as a highly customisable and integrable Mobile-ready tool.